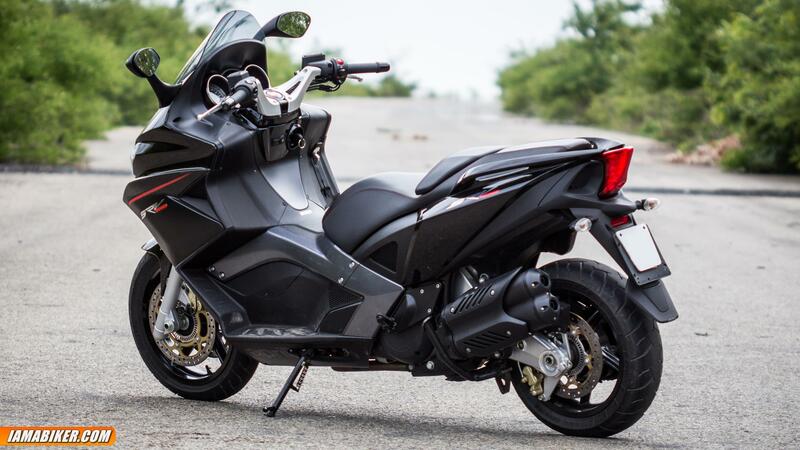 The Aprilia SRV 850 is one of those machines that make you ask a lot of questions, especially in this part of the world where a scooter of such phenomenal proportions are very confusing to the masses. Scooters have a very defined role in the subcontinent and the Aprilia SRV 850 suddenly comes in and makes a statement that few can ignore. Well this one is not for the masses even by a long shot, but what it promises to deliver is a blend of many worlds, and what these worlds are we will define in the course of this review. 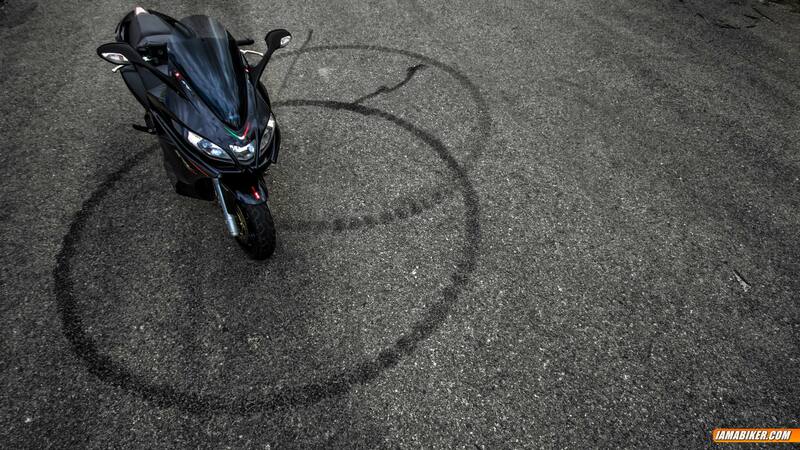 Having lived an earlier life as the Gilera GP800, the Aprilia SRV 850 is not just a rebadged entity, it looses weight, gains power and gets some of Aprilia’s best electronics packages. It is by far the most interesting vehicle we have tested on Indian roads simply because of all the confusion and questions it brings up. 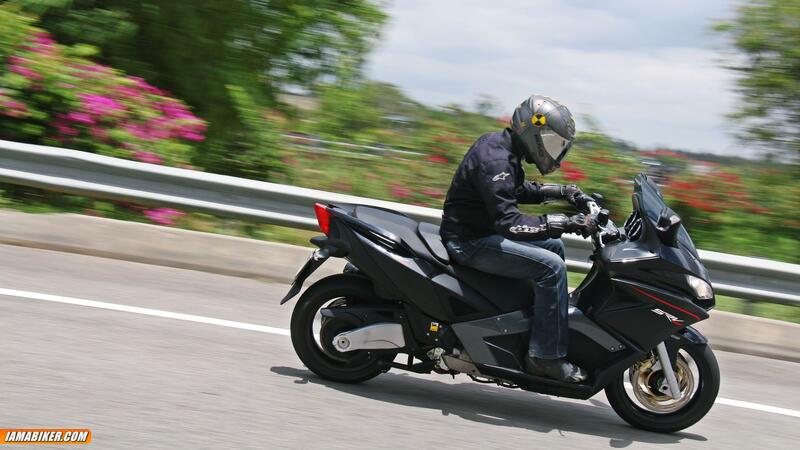 The verdict might surprise you as well, so lets not delay this further, but for the record let’s just state, thinking of the Aprilia SRV 850 as just a scooter probably is one the biggest mistakes you can make. Powering the Aprilia SRV 850 is a 90 degree 839cc fuel injected V-Twin that puts out power and torque figures of 75 HP @ 7750 RPM and 76.4 Nm of torque at 6000 RPM. On road this translates to claimed top speed of close to 205 kmph and acceleration figures of 0 -100 in less than 6 seconds. On our stint with the SRV 850 we touched a top whack of 185 kmph, it definitely had the juice to go further and 200 kmph would have been easy should the road have permitted. Timed 0-100 acceleration stood at 5.8 seconds averaged after 3 runs. Those numbers confirm the SRV 850 as the most powerful scooter ever, in-fact these numbers put a lot of motorcycles out there to shame as well. Power delivery is linear, but we must say there is a slight blank spot around the 2000 RPM mark but you are almost never there. The SRV 850 surges ahead without drama, almost silent and before you know it, you will be doing speeds of 140 – 160 kmph without the slightest hint of stress from the engine. Its only past 170 that you feel the power thinning out, but it still keeps climbing. Again, even at constant 170+ kmph speeds, the engine and the machine as such are with you, rock solid and willing to go further. Its only the wind speeds that hits you right at the top half of the helmet that bothers you (for our taller test riders of course). Performance like this is definitely meant for the highways you’d think, but the SRV 850 is pretty comfortable at city speeds and the CVT (continuously variable transmission) stays always ready to back you up. You can easily roll about at 10 kmph without a stutter and pull away cleanly or in fact shall we say dart ahead with the slightest twist of the throttle. We did not face any heating issues even after prolonged use in slow moving traffic. Fuel consumption was at around 16 kilometres to the litre and that’s with combined riding in city traffic speeds and high speed highway cruising, that means you have a decent range of about 300 km give or take on a tank full. We initially thought that the traction control on the SRV 850 was an overkill, but with the power the SRV 850 has to offer and how it delivers it right on tap, it definitely is better to have it than not. It’s almost fun to feel the traction control at work, even with sport mode turned off it allows for a little bit of shall we call it “that feeling” in your gut when you push it around and with sport mode on the traction control is less restrictive. One thing about the sport mode that you should know is that it does not effect the power delivery in any way, it basically only reduces the intervention of the traction control and ABS and its not a huge difference either. The Aprilia SRV 850 looks big, and when we say big it practically dwarfs anything else on two wheels, its got this presence that’s really unmatched. Once you spot it, you just cannot take your eyes off it, the front design borrowed from the RSV4, the huge windscreen that swings back, the massive cushioned seats, the neat looking double canon silencers and the massive aluminium swing-arm, it all looks majestic. Definitely the size is intimidating but all that just disappears and you feel at ease the moment you hop on to the SRV 850. Suddenly you feel in control and you just know for sure it’s something that you can tame with ease. Build quality is top notch everywhere and its almost impossible to find fault with what’s in front of you. Good quality plastics and all the individual pieces slot in and fit together perfectly. 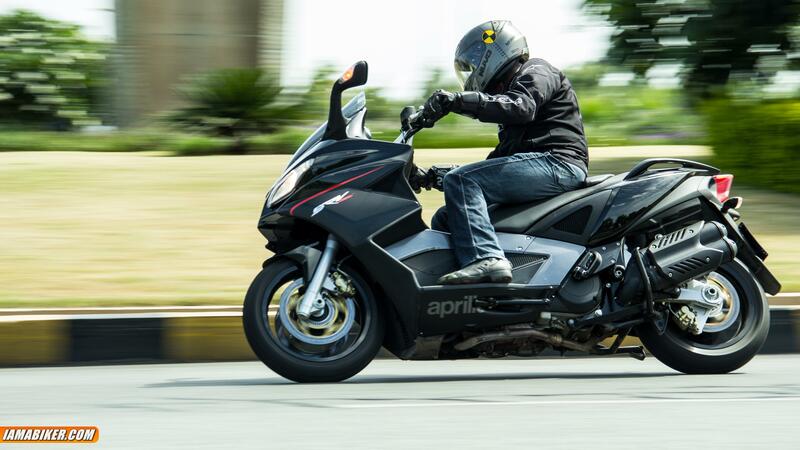 The Aprilia SRV 850 is no slouch and can do some real good speeds. But you will be surprised to know that it handles pretty well too. Yes, tight turns are not its piece of cake and its got a pretty decent turning radius, but all this is just something that you need to get used to as the handling characteristics are a bit different. Once you have had some decent mileage on the SRV 850, you get comfortable with it and soon enough you will be taking those tight turns in a breeze. The weight distribution is a bit forward biased but the low centre of gravity means, even at slow city traffic speeds you can move forward without dragging your feet. As things get faster it just keeps getting better. The SRV 850 can keep up with your urges of doing some really energetic riding, it can even do some mean angles. Its extremely stable once leaned over and can really hold itself through bumpy turns as well. Coming to the suspensions, it’s a good mix of both worlds, the rear one is adjustable upto seven steps, while the front forks maybe were a bit too soft as they compressed quite a bit just by sitting on the scooter. We were right at the middle setting for the rear and the ride was just perfect, even two up things were very stable and confident leaned over, but the suspensions clearly are not that comfortable on bumpy or bad roads. The twin Brembo’s up at front and the single at the rear perfectly compliment the 16 inch Pirelli at front and the 15 inch one at the back. The tyres provide strong grip in urban conditions, but are a bit twitchy in dusty and wet conditions, and its here that the ABS and traction control really compliment the SRV 850. 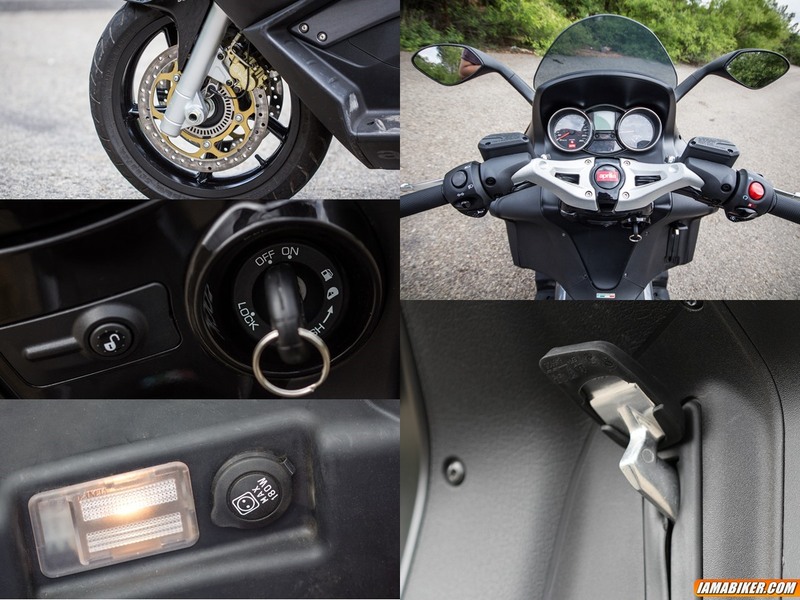 <>The Aprilia SRV 850 is one loaded scooter, handbrake, assisted raise seat movement, undeseat lights and charging point, button release for seat lock, multi-function instrument meter and to top it all, like we already know ABS and traction control. The switch gear has multi-function actions to control the meter display and options to toggle traction control and sport mode. The underseat storage can easily hold a half faced helmet and just about hold certain models of full face ones but a glove compartment up front is certainly missed. The mirrors are rock solid and provide good visibility. Probably the best feature apart from all the ones we have already mentioned are the headlights, the twin headlights are extremely powerful and couple that with the centre high beam and there is no situation where you need more light. The centre stand, (yes it has a centre stand) is easy to operate and the SRV 850 just moves on and off it with ease. 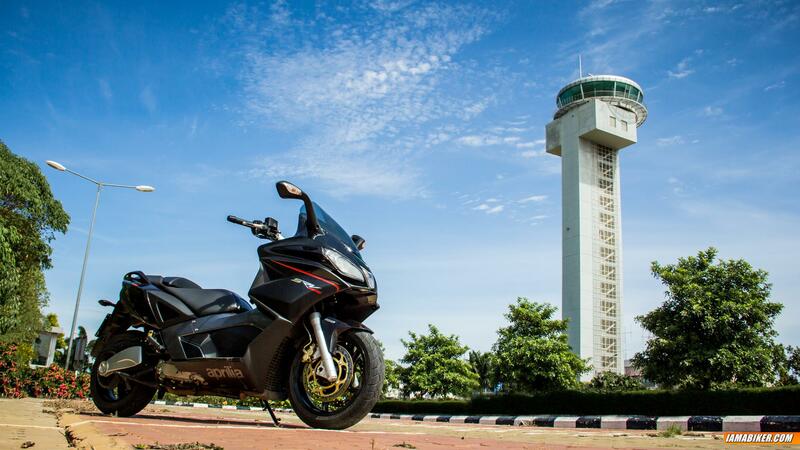 So if you have not figured it out yet, the Aprilia SRV 850 is a machine that brings the best of two worlds, all the comfort and ease of a scooter mixed with the dynamics and power of a motorcycle. If we have to say the truth, when we first got the SRV 850, we were unsure where it plugs in. But as we spent more time with it, the question soon changed to where does it not. It can munch miles all day long without breaking a sweat, it can potter around city even at single digit speeds, it’s comfortable, its’ pretty efficient, it’s big, it’s flashy, very different from anything out there and brings with it an aura of luxury that few can match. The SRV 850 quite literally grows on you, and by the time we were done with the testing, we really did not want to let go of it, and that’s saying a lot. Rear Shock absorber Laterally mounted, horizontal, hydraulic monoshock. Seven-position spring preload adjustment.